Out of thousands of teachers in the country, Dr. Marilyn Proctor-Givens won $2,000 for her classroom. She let out a celebratory yell and spontaneously threw up her hands in a way that sort of signaled a touchdown, for she had just scored one for her students. 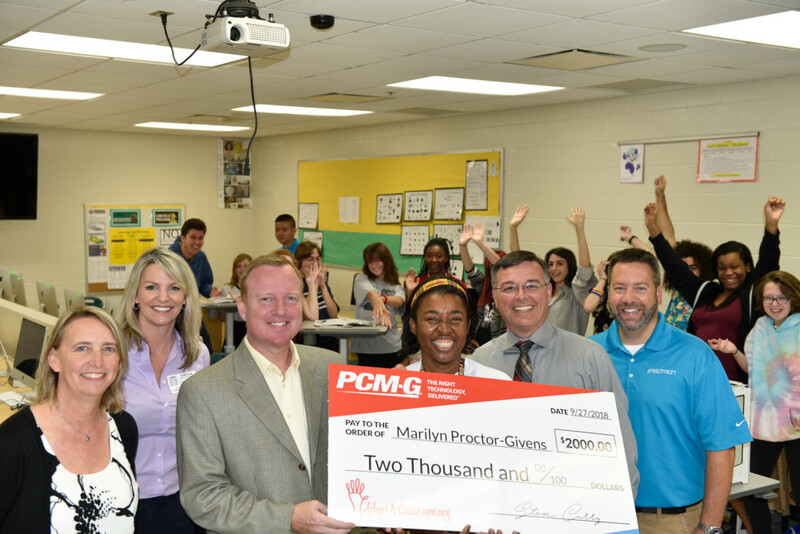 Lincoln High School teacher Dr. Marilyn Proctor-Givens on Thursday became a national Star Teacher, an awards program of IT solutions company PCM-G that gave her $2,000 to purchase equipment, supplies and technology for her array of art and design classes. The award included, from ergonomics products maker Ergotron, mobile height-adjustment desks for her students and a sit-stand workstation for herself. Representatives of both companies joined Lincoln High Principal Dr. Allen Burch in presenting the award and equipment to Proctor-Givens in front of her students in one of her digital art classrooms. The award qualifies her for a $10,000 grand prize in a succeeding national competition. The companies and the school saw to it that she didn’t know Thursday’s award was coming. PCM-G conducts the Star Teacher Award contest, for STEM teachers, in a partnership with AdoptAClassroom.org. Each quarter, the contest showcases three national teachers in science, technology, engineering and math. Teachers submit a video that emphasizes their classroom needs, and they embark on a campaign to get people to visit PCM-G’s Star Teacher Award page and vote. On average, that page says, teachers every year spend $740 of their own money on classroom materials. Proctor-Givens is in her 33rd year as a teacher at Lincoln. She’s engaging and energetic, and she’s an artist herself. She helps students attain Adobe certifications in design software, and she emphasizes technology such as 3D printers, which create solid three-dimensional objects from digital files. She says she aims to use the $2,000 award to buy filament that produces less of an odor than the filament that her students often must use in their 3D silk-screen printing, a basic technology. It’s also about teachers who mold, prepare and inspire.